...when you subscribe to the Litchfield Builders Blog! Get the best return on your investment on your next home remodel. See how you can get the most out of your next home remodel by knowing what to expect and how to prepare. Remodeling projects that will affect the overall cost and budget. How to identify what type of homeowner you are and your priorities. The types of remodels you should and shouldn't invest in. How to add true value to your home before you make the move to sell. 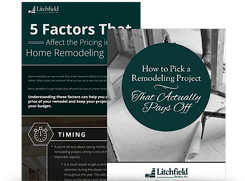 Simply fill out the form on this page to subscribe to the Litchfield Builders Blog, and receive your free toolkit instantly! Share this offer with a friend. © 2016 LITCHFIELD BUILDERS. ALL RIGHTS RESERVED. SITE DESIGN & DEVELOPMENT BY IMPACT.